Pretty much all the cooking I’ve been doing lately has focused around the obsessive need to Use Up Stuff because we’re moving and the idea of carting all that food – the pantry items, the bags of flour, the dozens and dozens of spices – and then forcing my new flatmates to live among it (picking their way over fenugreek and coriander) is just a bit much. I made these dark chocolate and ginger chip biscuits to take with me to a friend’s – we’d planned to watch a film and catch up – though we called it off because of the riots (both of us live in areas which were affected). And now there are very few cookies left. At first I planned on soft, dark chocolate cookies glittering with chopped candied ginger but found this recipe, which also used oats! And there was a handful of oats in the cupboard too, so it was meant to be. I adapted the recipe in a few ways: using more oats and flour, adding a dash of salt, and using less chocolate and ginger. They’re chewy because of the vegetable oil, with a slight crunch around the edges. I find the sweetness level fine but if you have a very sweet tooth you might want to increase the amount of sugar, maybe even doubling it. The amount of ginger means they’re not overwhelmingly gingery, so if you enjoy having your head blown off by a ginger explosion (or if you have a blocked nose), add more. 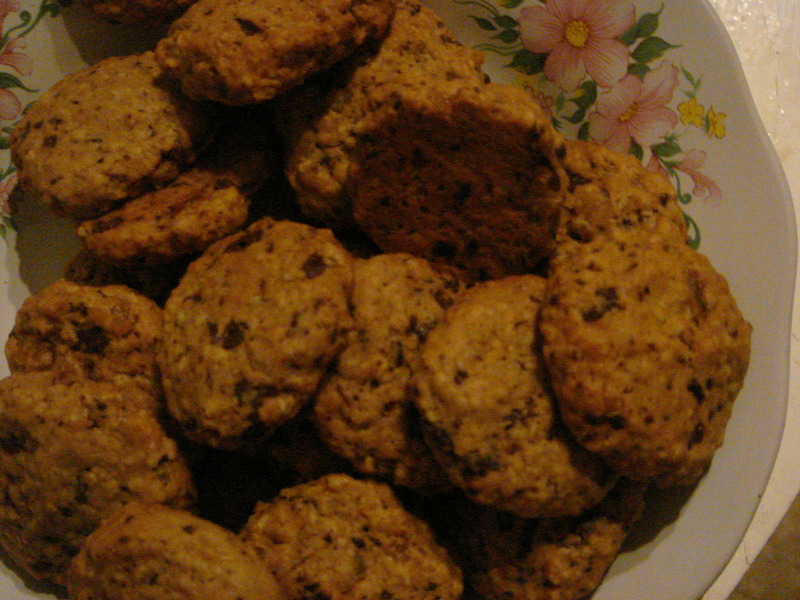 I made the cookies quite small and delicate – about two teaspoons’ worth of dough. The photo is a bit misleading! They don’t spread very much on the baking sheet which was convenient when gauging size.